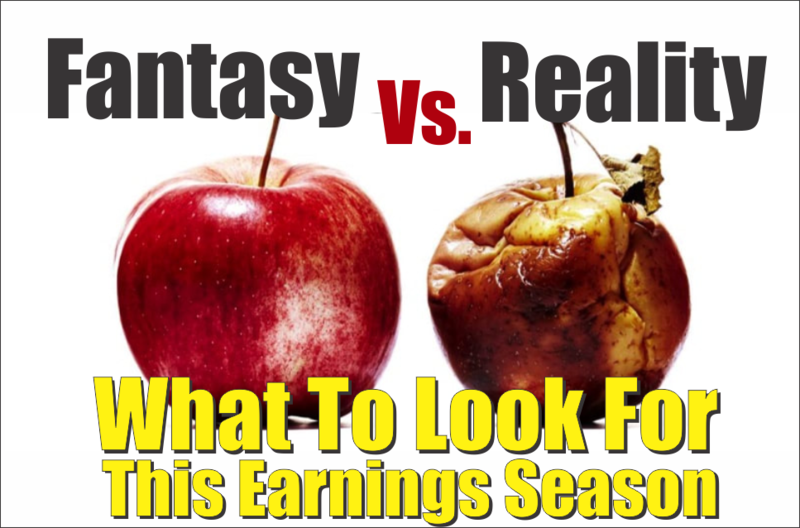 I recently sat down with Peak Prosperity’s Chris Martenson to discuss an article I wrote last year on why another 50% correction is possible. I have attached a link to the original article below the interview along with a the chart and explanation of the RIA Economic Composite Indicator I discuss with Chris. 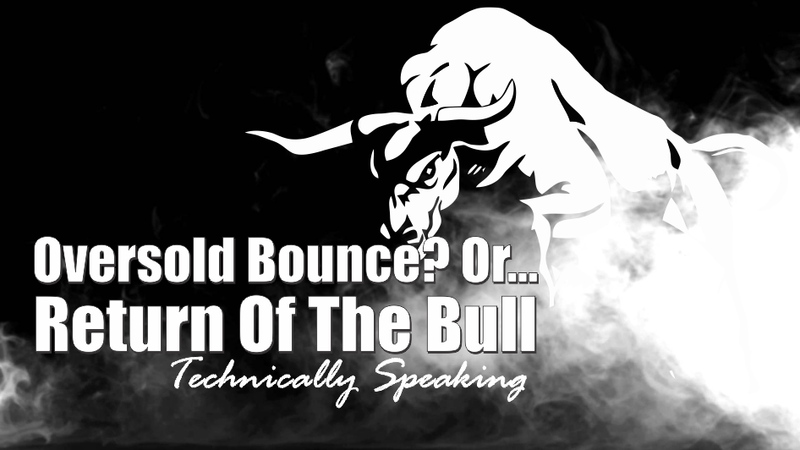 In other words, at least for me, it is the overall TREND of the market which determines a bull or bear market. Currently, that trend is still rising. But such will not always be the case, and we may be in the process of the “trend change” now. In 2008, when the Fed launched into their “accommodative policy” emergency strategy to bail out the financial markets, the Fed’s balance sheet was only about $915 Billion. The Fed Funds rate was at 4.2%. If the market fell into a recession tomorrow, the Fed would be starting with roughly a $4 Trillion dollar balance sheet with interest rates 2% lower than they were in 2009. In other words, the ability of the Fed to “bail out” the markets today, is much more limited than it was in 2008. One of the most important issues overhanging the market is simply that of valuations. As Goldman Sachs pointed out recently, the market is pushing the 89% percentile or higher in 6 out of 7 valuation metrics. Given that valuations are at 30.5x earnings, and that profit growth tracks closely with economic growth, a reversion in valuations would entail a decline in asset prices from current levels to somewhere between 1350 and 1650 on the S&P (See table below). From the recent market highs, such would entail a 54% to 44% decline respectively. To learn how to use the table below to create your own S&P 500 forecast give RIA Pro a 14-day free trial run. This also corresponds with the currently elevated “Price to Revenue” levels which are currently higher than at any point in previous market history. Given that the longer-term norm for the S&P 500 price/sales ratio is roughly 1.0, a retreat back towards those levels, as was seen in 2000 and 2008, each required a price decline of 50% or more. Economic growth is slowing and, as I penned just recently (see article for composite index makeup), the domestic economy has already shown early signs of a more significant slowdown. Given that corporate profits are a function of economic activity, it should not be surprising that the rate of change of the S&P 500 is closely tied to annual changes in the Economic Output Composite Index. “An April 2016 Moody’s analysis pegged the total 75-year unfunded liability for all state and local pension plans at $3.5 trillion. That’s the amount not covered by current fund assets, future expected contributions, and investment returns at assumed rates ranging from 3.7% to 4.1%. Another calculation from the American Enterprise Institute comes up with $5.2 trillion, presuming that long-term bond yields average 2.6%. Of course, the key ingredient is ownership. High valuations, bullish sentiment, and leverage are completely meaningless if there is no ownership of the underlying equities. 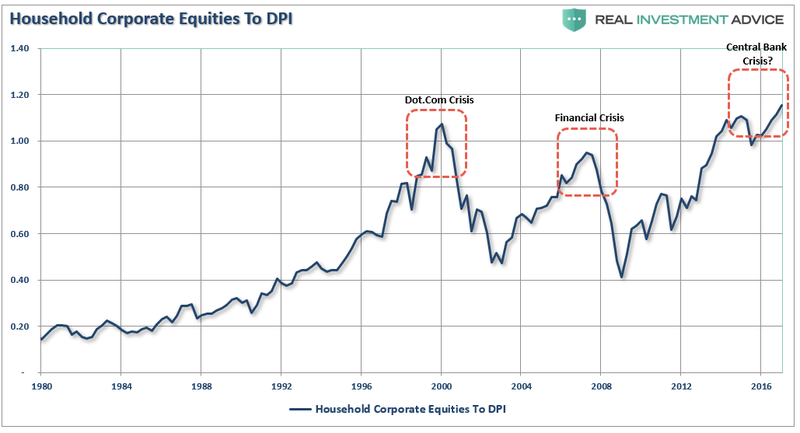 The two charts below show both household and corporate levels of equity ownership relative to previous points in history. As can be clearly seen, leverage fuels both halves of the full market cycle. On the way up, increases in leverage provide the capital necessary for accelerated share buybacks and increased speculation in the markets. Leverage, like gasoline, is inert until a catalyst is applied. It is the unwinding of that leverage that accelerates the liquidation of assets in the markets causes prices to plunge faster and further than most can possibly imagine. The chart below shows the real price of the S&P 500 index versus its long-term Bollinger-bands, valuations, relative-strength, and its deviation above the 3-year moving average. The red vertical lines show where the peaks in these measures were historically located. What causes the next correction is always unknown until after the fact. However, there are ample warnings that suggest the current cycle may be closer to its inevitable conclusion than many currently believe. There are many factors that can, and will, contribute to the eventual correction which will “feed” on the unwinding of excessive exuberance, valuations, leverage, and deviations from long-term averages. The biggest risk to investors currently is the magnitude of the next retracement. As shown below the range of potential reversions runs from 36% to more than 54%. That can’t happen you say? It’s happened twice before in the last 20 years and with less debt, less leverage, and better funded pension plans.